As our work on the AIM Buddy Project wraps up, the Digital Production Group at WGBH pauses a moment to reflect on what we’ve learned during our development of the five interactive comics and games . 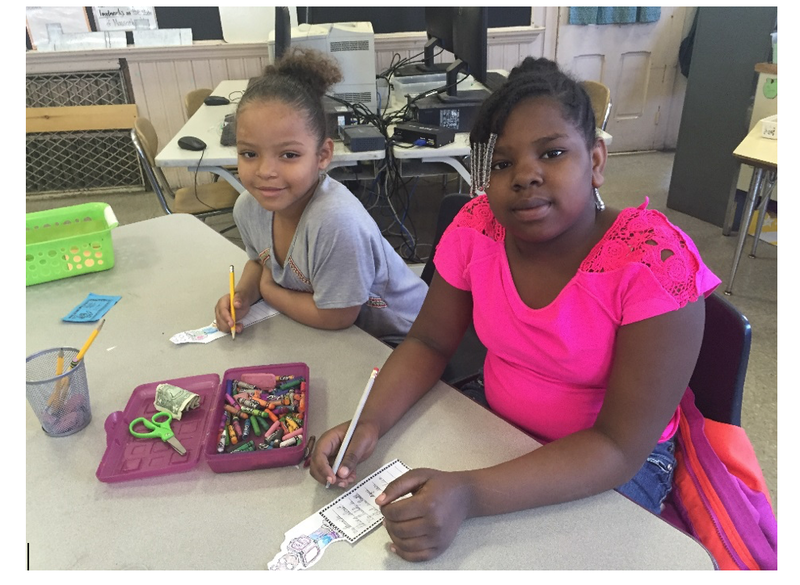 . .
We created the five AIM interactive comics and games because we EMPATHIZE with kids, parents, and teachers. Everyone has challenges living in today’s world. Our goal is that the AIM interactive comics and games will help kids navigate the rough patches and challenges they encounter in everyday life. Helping kids understand why it’s not always easy to be honest even when they know “honesty is the best policy”. When we began this project, we knew that a large part of our process would be testing with kids. We have learned over time that there’s nothing like kid-testing a product to teach us that things don’t always work the way we think they will––nothing says “change your approach to this game” faster than a handful of kids quickly losing interest. So, we have LEARNED FROM OTHERS, and humbly thank all of our kid-testers for helping make the interactive comics and games all they could be! Developing a new product involves a team of people who share their time, expertise, and energy––and the AIM program was no exception. To everyone who contributed, from school districts willing to test the program in the classroom to teachers who integrated the AIM interactive comics and games into their already-stretched schedules to students who took time from their regular school days to play and learn with us, and to partners who worked diligently to gather information, guide, and advise us––your GENEROSITY in sharing your time and expertise is greatly appreciated! 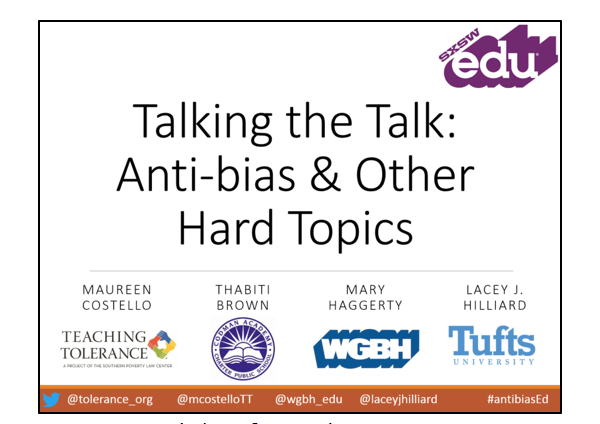 Since we’re not currently holding any grudges, this topic’s a little harder to write about––but the entire Digital Production group at WGBH wants to thank YOU for your continued interest, encouragement, and persistence in sticking with us through the entire development process . . . and we ask your FORGIVENESS if we ran astray once or twice! 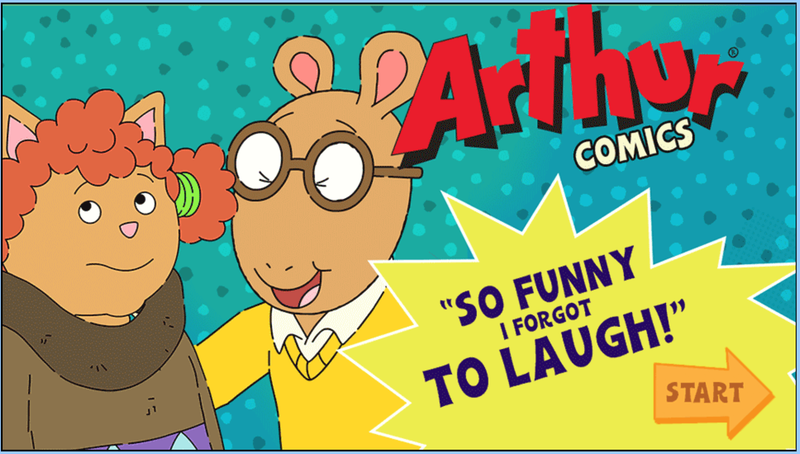 This fall, Arthur’s 21st season premieres on PBS KIDS! In the new season’s exciting adventures and heartfelt stories, Arthur continues to model prosocial behaviors as he navigates through the challenges of childhood with empathy, kindness, and respect for others. 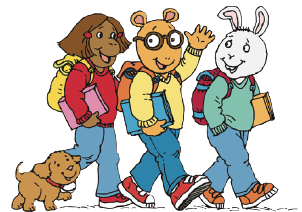 As always, Arthur and his friends showcase the importance of being able to communicate effectively when dealing with conflicts, relationships, and everyday issues in the new season’s episodes—whether it’s banding together to save the library from closing or starting a pet toy business. The kids in Elwood City will learn about ways they can work together, help one another, and contribute to their communities. New episodes will also stay true to the tradition of tackling tough issues that kids face every day. In one upcoming story, “Binky’s “A” Game,” Binky comes face to face with the topic of honesty—one of the key character attributes of the AIM Buddy Project. 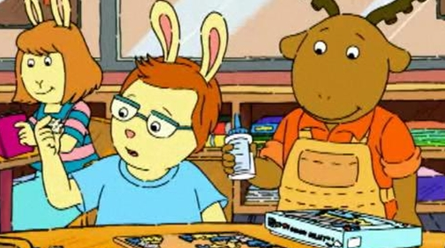 When Binky gets an “A” on a test, all of his friends think he cheated! Is it possible that Binky actually studied? In another story, “Brain and the Time Capsule,” Brain tackles another one of the AIM program’s key topics—generosity—as he learns that sharing with his friends is not always easy. When choosing what things to bury his time capsule, Brain has to decide how much space in the capsule he would like to share with his friends. And what would October be without the premiere of an all-new spooktacular Halloween special, “Arthur and the Haunted Tree House”! 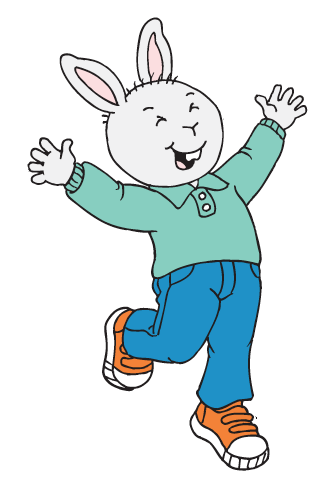 In this one-hour special episode Arthur and his friends work together and help one another get through these spooky adventures: Francine meets an elderly woman with a mysterious past; Binky finds himself at Mr. Ratburn’s amazing haunted house; Muffy and Bailey decide to cut through a rainy cemetery; Arthur, Buster, and Ladonna try to solve the mystery of who—or what—is haunting the tree house! 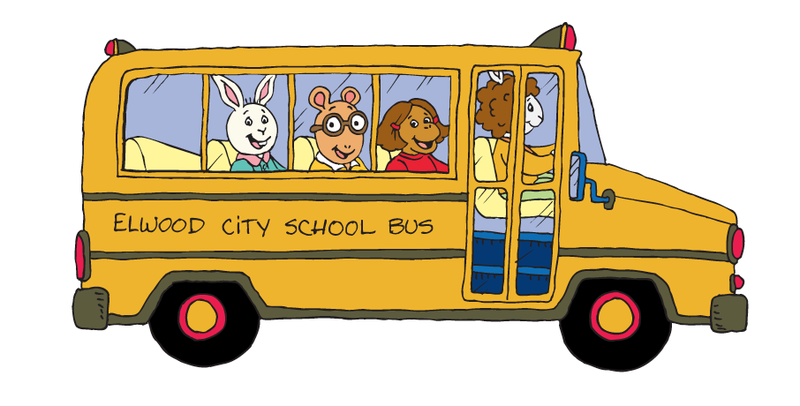 Join Arthur and his friends for another season of adventure, friendship, and fun! 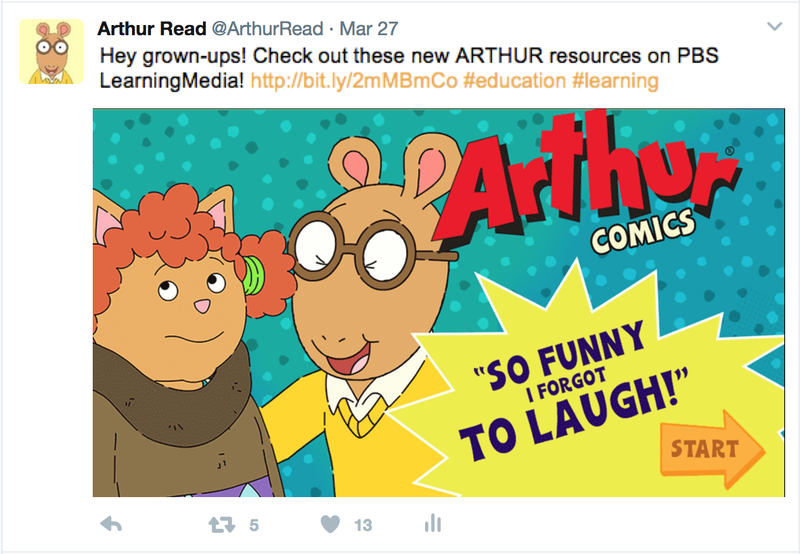 The five AIM interactive comics and games give kids opportunities to learn alongside Arthur and his friends as they navigate through some tricky everyday situations. In “So Funny I Forgot to Laugh,” kids learn that having empathy—being willing to understand how someone else feels—is key to getting along with others, and treating everyone with respect and dignity. 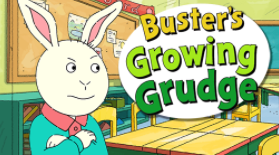 In “Buster’s Growing Grudge” kids learn that it’s not always easy to forgive someone, but forgiveness is the best way try to work things out so you can let go of your angry or hurt feelings and move on. 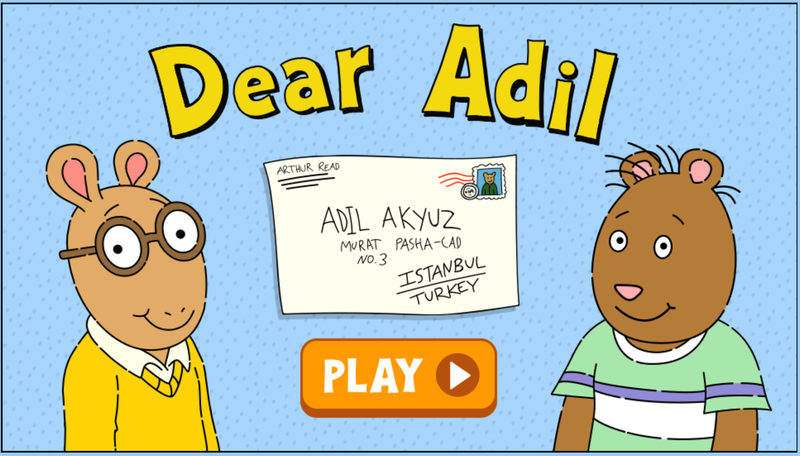 In “Dear Adil,” kids learn the importance of being open to learning from others, as Arthur insults a new penpal by making wrong assumptions about him. Being open to asking questions and learning about others is key to opening up a whole new world. 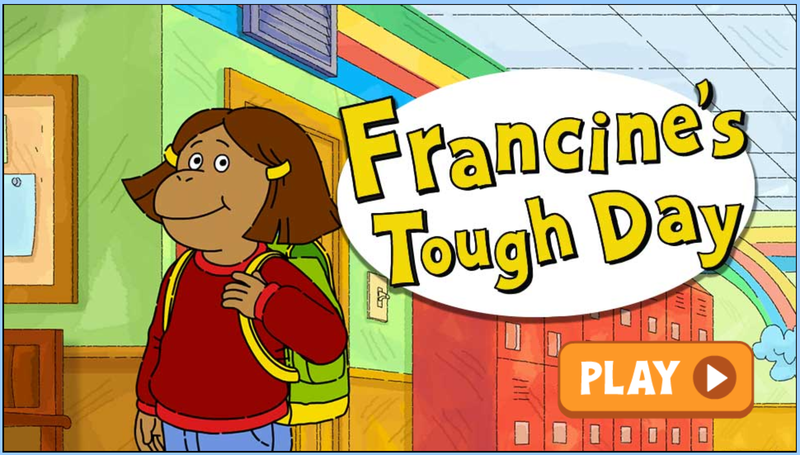 In “Francine’s Tough Day,” kids learn the importance of telling the truth, even when it’s hard to do, and understand that telling falsehoods will generally lead to more problems. 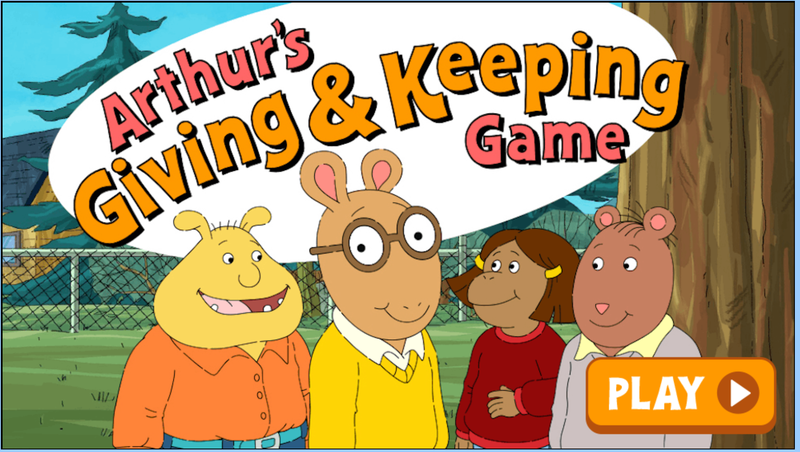 In “Arthur’s Giving & Keeping Game,” Arthur and his friends help kids explore the ins and outs of generosity—why it can sometimes be difficult, but also why it’s always rewarding. All of the AIM topics—empathy, forgiveness, learning from others, honesty, and generosity—are integral to living in today’s ever-shrinking world, where people from different countries and cultures are increasingly interacting with each other. And the classroom discussions sparked by these interactive comics and games is a great start for kids to learn how to live as responsible and caring citizens who can make a positive impact on the world they live in. 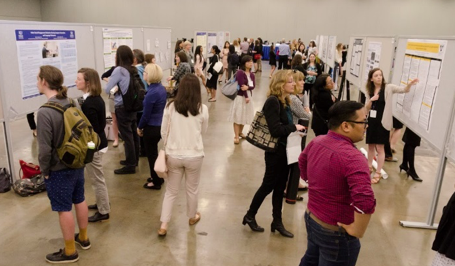 AIM Goes to SRCD in Austin, TX! 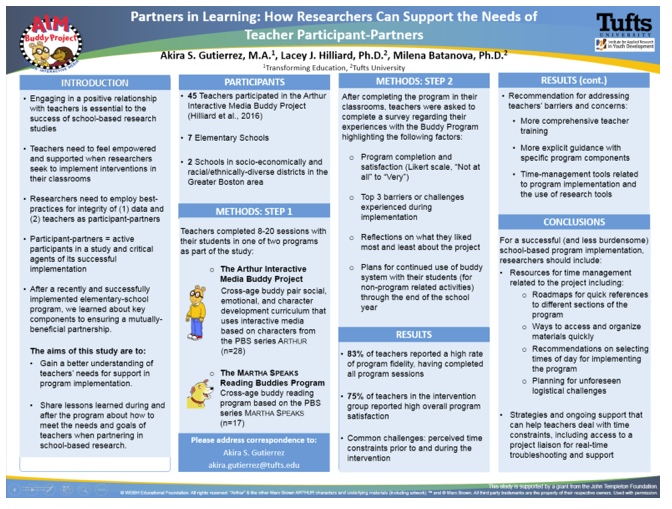 The AIM Buddy Project was well represented in two presentations at the 2017 Society for Research in Child Development (SRCD) Conference in Austin, TX. In attendance were close to 6500 professionals and graduate students in psychology, human development, family studies, education, public policy, sociology, social work, psychiatry, pediatrics, and public health. This increase in complexity was not seen in students who reported bullying behaviors both before and after the program. The majority of these students gave a very poor definition of bullying. This data suggests that, overall, “So Funny I Forgot to Laugh” helped students understand the topic of bullying more deeply. 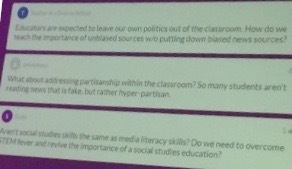 encouraged attendee interaction and discussion on how researchers can help support schools in implementing programs, conducting research, and applying research findings within their school. 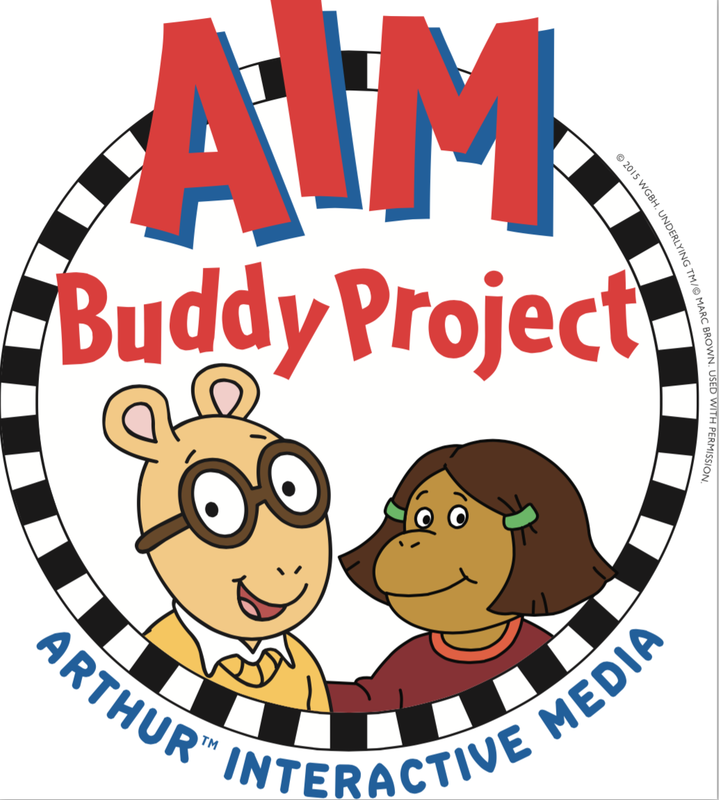 Stay tuned for more on the AIM Buddy Project Research Study! 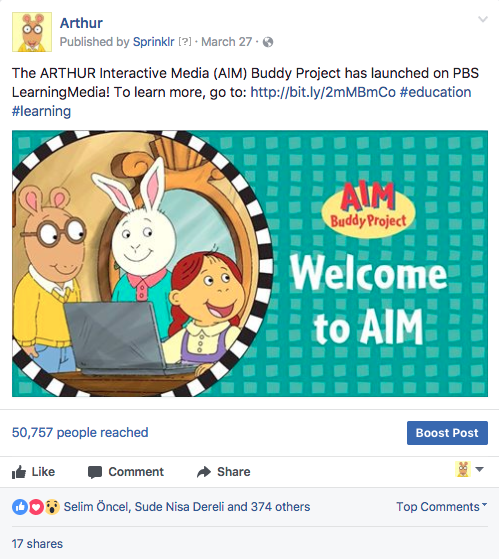 AIM Buddy Project Hits Social Media! 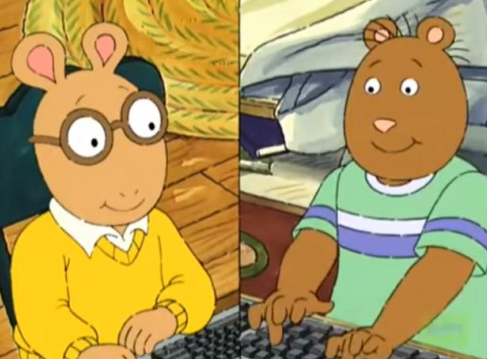 Millions of fans tune in to follow the adventures of their favorite eight-year-old aardvark, Arthur, on television or interact with the characters on the ARTHUR website or stream episodes of ARTHUR on their mobile devices. 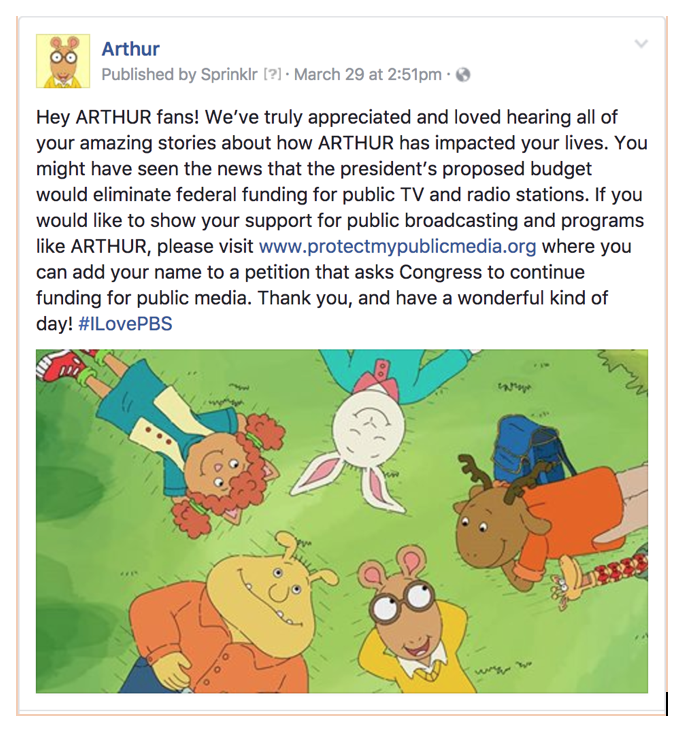 But ARTHUR has a lot of fans on social media, too–over a million fans from around the world follow ARTHUR on Facebook and other social media platforms. So, what better way to raise awareness to the Arthur Interactive Media (AIM) Buddy Project among our social media audiences than to bring the program directly to social engagement platforms. 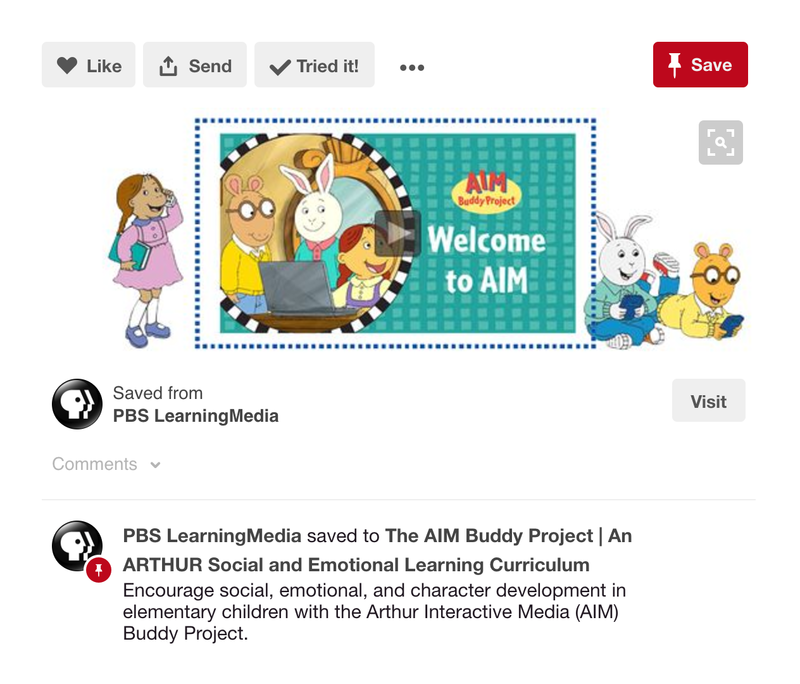 Look for the AIM Buddy Project on your favorite social engagement platform–and be sure to ‘like’ us! 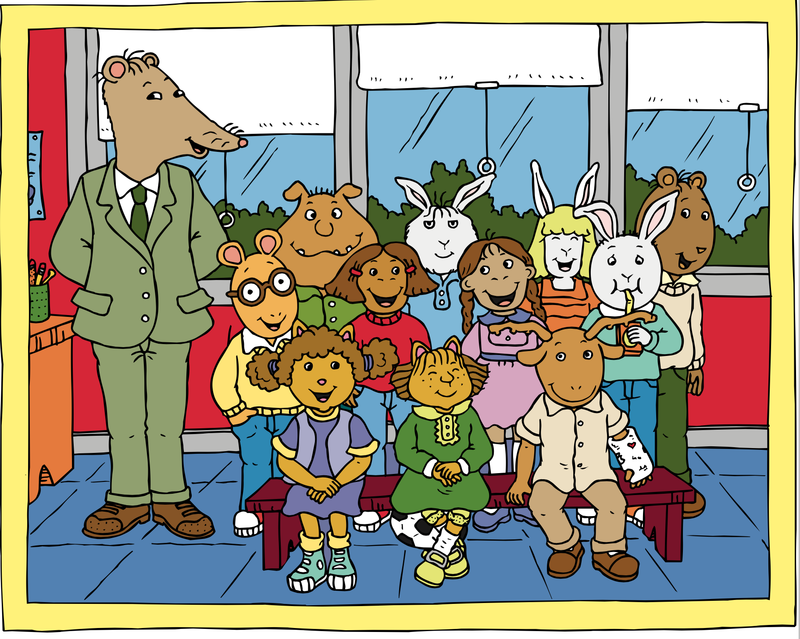 Every year, millions of people all over the world watch Arthur. With so many stories that make viewers laugh, think, and explore, it is no surprise that Arthur has connected with generations of fans. 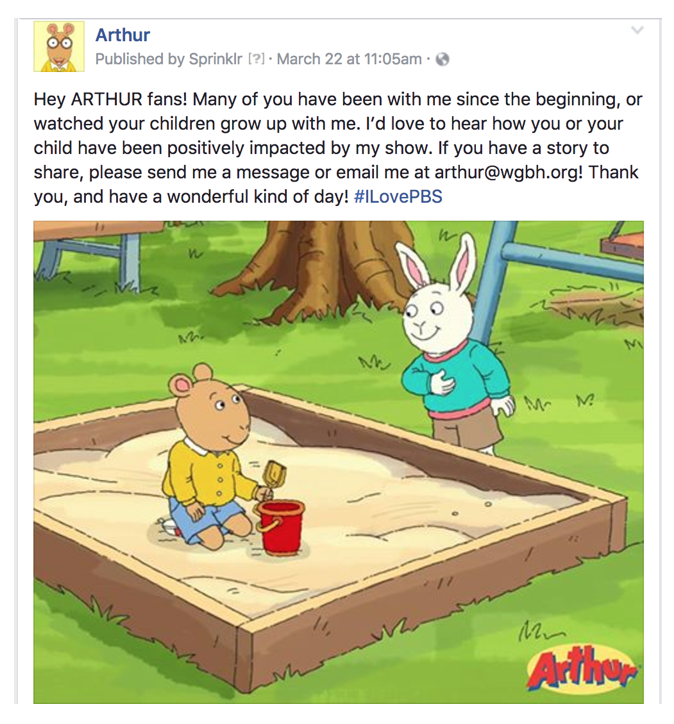 Recently, the Arthur team reached out to followers on social media, asking fans to share stories about their relationship with the show and how it has positively impacted their lives. We received hundreds of heartwarming messages from our wide audience. The Arthur team was thrilled and gratified to receive such positive feedback. If you have an impact story to share, please email us at arthur@wgbh.org. We hope Arthur has helped you have a wonderful kind of day!